How to React When You Meet Your Ex at a Party? If you’ve read the 3 Step plan, then you know that I highly recommend not contacting your ex for a short period of time when you are working on getting your ex back. But, what should you do if you meet your ex at a party? Should you snub them? Should you go to them and start pouring your heart out? Should you have a drink with them? Well, if you find yourself at a party with your ex and you are still in the no contact period. Here is what you need to do. As soon as you enter the party, find a group of people you can feel comfortable with and hang out with throughout the night. Stick with the group of people for most of the time. You don’t want to start talking to your ex right now because you are in the no contact period and talking to them might really screw up the main purpose of the no contact period. However, you also don’t just want to blatantly ignore them because that will be rude. Ideally, you want your ex to come and talk to you. If they do come and talk to you, just a little chit chat won’t hurt anyone. Make sure you have an excuse to get away from the conversation. Try to keep it as brief as possible. Once the conversation has run its course or you feel it’s getting longer than it has to be, just make up something quickly and get away from them. You don’t even have to make up something, just tell them that you’ve got to get going or you have to get back to your friends. Be CORDIAL and TENDER. 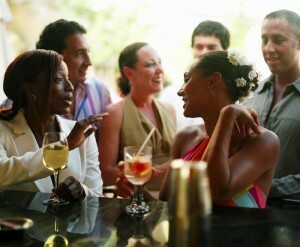 You absolutely must give the impression that you are having a good time at the party. But don’t overdo it, so it becomes obvious that you are trying to make them jealous. If your ex doesn’t come to talk to you, just say a quick Hi right before you are about to leave. Like I said, keep it short and sweet. Make sure that you moderate your alcohol consumption in a party where your ex is present. If you get drunk, then I guarantee you that you’ll do something stupid which will just blow your chances of getting back together. If you and your ex work at the same office, you can use the same formula of conversations whenever you feel it is impossible to avoid a conversation. Keep it short and sweet. Resist that temptation to talk about the past, the future, getting back together, asking them out for a date, or anything that isn’t allowed in the no-contact period. Remember, there is a time for everything and if you just follow the plan, you will become immensely attractive to your ex which will just make them fall in love with you all over again. This all makes sense but what happens if you lived together, the no contact period is kind of impossible for a while. you move out and then stop talking? Next post: Why Did Your Ex Leave You? Previous post: Is My Ex Over Me? Is My Ex Thinking About Me? Does My Ex Still Love Me?